Before Texas Hold’em blew on in and took over as the world’s most popular poker game, Seven Card Stud was typically the most popular poker variant found in casinos. Like most poker variants, the aim of Seven Card Stud is to play the best hand from the cards you are dealt in order to win the pot. Try 7 Card Stud at 888Poker! Gameplay requires the right amount of player skill, betting strategy and plain old good luck. You can play Seven Card Stud at leading websites like 888 Poker and Pokerstars, which you can read more about lower on the page. When playing Seven Card Stud, an ante, minimum and maximum bet are all imposed for each game. These limits are much more flexible online, so small bettors are able to play, unlike in many brick-and-mortar casinos. Seven Card Stud is played using a standard 52 deck of cards, excluding the jokers. Throughout the course of a game, players are dealt seven cards, however only the best five card hand is used to determine the winner. 1. The game begins with each player placing an agreed upon ante, which is the bet required to enter into a hand of Seven Card Stud. The collection of ante bets establishes the ‘pot’ which becomes the winning prize. 2. Each player is first dealt three cards; one face-up card and two face-down hole cards. This deal is known as ‘Third Street’. 3. This leads to the ‘Bring In’ round which is determined by the player with the lowest face-up card. 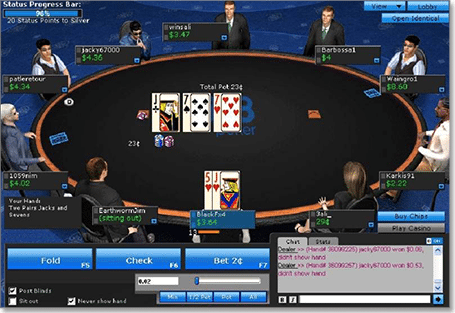 This player starts the round by placing a bet that must be at least equal to the ante or equal to the minimum bet and bets continue clockwise around the table until all players have placed a bring-in wager. 4. Each player is now dealt another face-up card, known as ‘Fourth Street.’ The player whose face-up cards have the highest value now starts another betting round where they can either choose to fold or call anywhere up to the maximum betting limit. 5. A fifth face-up card is now dealt to each player who remains in the game, with this deal known as ‘Fifth Street.’ Again, the player whose face-up cards have the highest value starts this betting round. From Fifth Street onwards, the maximum bet must be wagered to continue in the hand. 6. Like Fourth and Fifth, Sixth Street requires another card be dealt to each player, and the player with the highest value card starting the next betting round. After all Sixth Street bets are placed, the final betting round begins. 7. Seventh Street now starts, where each remaining player receives their seventh and final face-down card. Betting begins with the same player who started the betting in Sixth Street and is the last round of betting. 8. If only one player remains standing in the game, they become the winner without having to reveal their final hand and they take home the pot. If more than one player remains, a Showdown round starts and each remaining player must reveal their hand. The winner is the player with the highest value five card hand that can be made out of their seven card hand. If more than one player has a hand of the same value, the pot is split evenly. In Seven Card Stud, two is the lowest value card and Ace is the highest. Where you can play online Seven Card Stud? As a popular poker variant, Seven Card Stud can be found at a selection of our recommended online casinos. These secure virtual poker venues also offer some tempting welcome bonuses for new players to kick off their real money online poker experience. You’ll also find a large range of poker variants at these websites including Texas Hold’em Poker, Omaha Hi/Lo, Razz and HORSE. Deposits and withdrawals can be made in AUD using a range of banking methods including direct bank transfer, credit card, PayPal and e-wallet services. Australians can’t play at online poker sites due to new gambling laws in full effect as of September 2017.